As we put another July weekend in the book, so to speak, we should consider the difference between relative and absolute time. Most people I know–in the Northern Hemisphere, naturally–have already succumbed to the creeping dread that summer is almost over, despite all evidence to the contrary on the calendar. If you’re panicking too, stay calm and enjoy yourself. We have plenty of summer still to come. 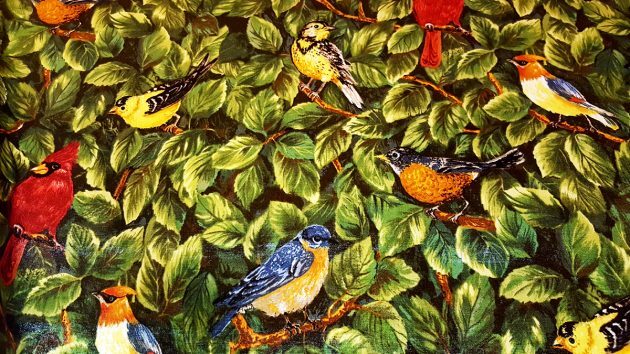 Speaking of summer, the coolest birds I saw this weekend were on the festive curtains (pictured above) in my son’s new cabin at sleepaway camp in the Finger Lakes. Pretty swanky, right? But if I have to pick a living bird, American Kestrels hunting along farm roads always work for me. Corey spent the weekend camping in the northern Catskills Mountains and was extremely pleased to have a family of fledged Eastern Kingbirds in and around the campsite. Tyrannus tyrannus is an exemplary Best Bird of the Weekend. I’m going with in your face views of Emerald Toucanet from Cinchona, Costa Rica. Although I might go with Fiery-throated Hummingbird and Flame-throated Warbler tied for an en Fuego duo around Poás, CR! Too hard to pick just one. No contest: a summer tanager at the bird bath yesterday afternoon. New to our northern NJ yard list, and I’m fairly certain new to my all-time-every-yard-ever list. No idea where this bird came from or where it was going. I was hiking on Mt. Rainier at 6,000′ and saw a lone Chipping Sparrow! I live on the West Coast, and have only seen them once before, years ago in Massachusetts. 4 Common Sandpipers that had returned from migration!